The "Antifa" (short for "Anti-fascist action"), also known as the ARA (short for "Anti-Racist Action") is a mob of far-leftists that seek to cause mayhem in the streets of America and Europe. Despite its name, the Antifa movement is an intolerant hate group that uses fascist tactics and direct quotations from Adolf Hitler. They are also anti-American in outlook, as when descending on an otherwise peaceful protest on Berkeley Campus in 2017, one chant demanded "No U.S.A. at all!" Although Antifa itself existed as early as 2017, the concept of anti-fascism, especially as a far-left ideology, existed as early as World War II for propaganda purposes, where Stalin referred to the USSR as "anti-fascist", with the obvious implication that the USSR and Stalin were "morally better" than the Nazis and Hitler, using the misapplication of Nazism and fascism as being of the far right instead of being of the far left. In the United States, Antifa is an effort the counter the rollback of socialist "progress" during the Obama administration. Socialists consider all forms of capitalism as "fascist," and the repeal of the Obamacare individual mandate was a devastating blow to "socialist progress." In the United States, they rose up at the University of California, Berkeley in response to Democrats losing the 2016 U.S. Presidential election. They claim that those individuals that support President Donald Trump and other conservatives are "Nazis". In Europe, they claim that supporters of right-wing, anti-establishment figures such as Marine Le Pen in France or the Alternative for Germany are "fascists" and "Nazis." Antifa groups have targeted Lega Nord in Italy. Antifa has targeted, intimidated, and harassed conservative figures simply because of political disagreements. 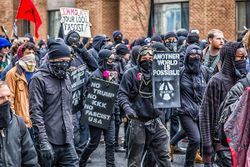 They dress in all black, wear black masks to hide their identities and attempt to disrupt rallies that are held in support of Trump. They use pepper spray on unsuspecting people, throw rocks, bricks, bottles, cement-filled soda cans, balloons filled with their own waste, punches, M-80s, march with flags and clubs, and commit vandalism and other criminal acts. They are militant, far-Left extremists that are a product of far-Left ideology, education, and funding. The Antifa does not support the First Amendment and the freedom of speech, as seen in their illegal shutting down of scheduled conservative speakers on college campuses. Its members have chanted support for the destruction of the United States, along with all national borders. Some witches and practicers of the occult who support left-wing policies have described themselves as "Antifa witches." Many in the leftist mainstream media applaud the Antifa's stance as they align with their #Resist agenda, and they have not taken a strong and clear stance against Antifa violence. Facebook permits them to have a page to rally support. Political figures in the U.S. Democrat Party and liberal European parties refuse to condemn their actions. There has been no condemnation of this group or its actions from California Governor Jerry Brown. Berkeley, California mayor Jesse Arreguín (who has ties to far-Left anarchist group By Any Means Necessary) has illegally ordered the city's police department to stand down while Antifa violence unfolds, which has caused a rift between the Berkeley Police and Arreguín. Likewise, Michael Signer, the Democrat mayor of Charlottesville, Virginia, illegally ordered a stand-down for the city's police department to allow Antifa to engage in a violent riot with neo-Nazi and white supremacist groups in what is widely suspected to be a Democrat-staged false flag operation. While Antifa tries to proclaim they fight against who they claim are "fascists" (erroneously lumping in the Alt-right and conservatives with legitimate fascists like Nazis and white supremacists), Antifa is, in fact, fascist and Nazi-like themselves in every aspect, being the very thing they claim to fight against. A quote, falsely attributed to Winston Churchill, is still correct in summing up this group of thugs, "When fascism comes to America it will be called anti-fascism." Widely viewed picture showing Antifa supporter nicknamed "Moldylocks" getting punched in the face. Numerous liberals, such as Dartmouth professor Mark Bray, have described Antifa's violence as a "positive" thing, casting it as necessary for a greater good – "combating the far right." House Democrat minority leader Nancy Pelosi first condemned Antifa violence only in August 2017. Tim Kaine refused to condemn Antifa. Mainstream media outlets promoted the false claim that violent left-wingers user their violence against conservatives to bring about "peace." Chuck Todd of NBC was criticized by conservatives for asking "softball" questions when interviewing Antifa sympathizers. On August 28, 2017, Tucker Carlson pointed out on his show that the Antifa is effectively the militant wing of the Democrat Party. Wikipedia editors have downplayed Antifa's violence and far-left-wing ideology and portrayed it favorably. The Southern Poverty Law Center, which has labeled numerous mainstream conservative organizations as "hate groups" but is itself a hate group in its own right, has refused to label Antifa a hate group. In October 2018, Portland mayor Ted Wheeler mayor defended his own decision to let Antifa block traffic and harass drivers and to block the police from intervening. The Antifa claims that its violence is necessary and legitimate to use in order to stop those who they believe to be "fascists" and "authoritarians." Like the Occupy Wall Street movement prior, Antifa is establishing branches in cities across the country. By their actions, people are demanding the group be labeled a domestic terrorist organization by the government. Picture showing Trump supporter nicknamed Based Stickman giving a wedgie to an Antifa protester. After previous Trump rallies were assaulted, right-wingers came prepared at the next rally and thoroughly embarrassed Antifa, pushing back hard. Assaults were widely viewed on social media. Antifa radicals tried to garner sympathy by establishing a GoFundMe.com account. With politicians and the liberal media largely ignoring the violence, it is only a matter of time before somebody dies as a result of all the hate, anger and criminal behavior being displayed by Antifa. Antifa groups have used violence in its anti-Trump demonstrations to the point where police in riot gear were needed, and protestors have used gas canisters and rocks. In June 2017, an Antifa website encouraged physical violence against Trump supporters, capitalists and others who hold conservative-leaning views. Since 2016, the FBI and DHS warned local governments of Antifa violence and its increasing occurrences, and they labeled its activities as "domestic terrorist violence." The New Jersey State Office of Homeland Security has designated Antifa a domestic terrorist group. In a major August 2018 protest in Washington, D.C., Antifa members threatened and physically attacked the police, as well as uninvolved bystanders including mainstream media journalists. They also carried signs promoting violence against people whose ideas they oppose, and many of them called for murdering the president. Some Antifa members, such as California philosophy professor Eric Clanton, received extremely lenient sentences compared to the violent crimes they committed as Antifa activists. In January 2019, Antifa leader José Alcoff, who had previously advocated for murder, was arrested for being connected to an attack on two U.S. Marines a few months earlier. Alcoff had been working with the Consumer Financial Protection Bureau and congressional Democrats to create new regulations on small businesses. The modern re-incarnation of Antifa was founded in 1988 in Minneapolis, Minnesota as well as Toronto, Canada to counteract white supremacist groups and Neo-Nazi groups. The organization can be traced to the “united front” of the Soviet Union’s Communist International (Comintern) during the Third World Congress in Moscow in June and July 1921. The idea of the united front strategy was to bring together left-wing organizations in order to incite communist revolution. The Soviets believed that following Russia’s revolution in 1917, communism would next spread to Germany, since Germany had the second-largest communist party, the KPD (Communist Party of Germany). It was at the Fourth World Congress of the Comintern in 1922 that the plan took shape. Moscow formed the slogan “To the Masses” for its united front strategy and sought to join together the various communist and workers’ parties of Germany under a single ideological banner that it controlled. Both the communist and fascist systems were based on collectivism and state-planned economies. Both also proposed systems wherein the individual was heavily controlled by a powerful state, and both were responsible for large-scale atrocities and genocide. In addition, the term "anti-fascism" was originally used by Stalin and the USSR prior to and during World War II as part of propaganda purposes to make the USSR seem mainstream by comparison to Nazi Germany. While leftist extremists claim to be fighting “fascism” while launching their attacks on other groups, the report states the term “fascism” has a double meaning under the extreme-left ideology, indicating the “fight against the capitalist system.” Antifascism is a strategy, not an ideology. They argue that the capitalist state produces fascism, or at least tolerates it. Therefore, anti-fascism is directed not only against actual or supposed right-wing extremists but also always against the state and its representatives, in particular members of the security authorities. An Antifa group, "Refuse Fascism," organized what it announced would be a series of major rallies in U.S. cities that would last until President Trump and Vice President Pence stepped down. Rather than millions of people, as it intended, the protests saw very low turnout. ↑ Knighton, Tom (July 10, 2017). 'Anti-Fascists' Applaud Speech Made Completely of Hitler Quotes. PJ Media. Retrieved August 21, 2017. ↑ Hoft, Jim (April 23, 2017). Far Left Antifa Thugs Riot in Paris After French Election Results Announced. The Gateway Pundit. Retrieved April 24, 2017. ↑ PICS: Violent ‘Anti-Fascist’ March on Le Pen Rally Before French Election. Breitbart News. Retrieved April 24, 2017. ↑ French presidential election: Leftist protesters grow violent after results come in. Fox News. April 24, 2017. Retrieved April 24, 2017. ↑ Montgomery, Jack (April 22, 2017). Far-Left Antifa ‘Protestors’ Attack Populist AfD Convention In Germany; Injure Police Officers. Breitbart News. Retrieved April 23, 2017. ↑ Tomlinson, Chris (August 16, 2018). Far-Left Anarchist Extremists Take Credit For Bombing Italian Populist Party Office. Breitbart News. Retrieved August 16, 2018. ↑ Miller, S.A. (November 8, 2018). Antifa expands its hit list as political violence escalates. The Washington Times. Retrieved November 8, 2018. ↑ Richardson, Valerie (August 20, 2017). Rise of antifa after violence in Charlottesville alarms free-speech advocates. The Washington Times. Retrieved August 21, 2017. ↑ Binder, John (August 12, 2018). Watch – Antifa Chants Death to America: ‘No Borders! No Wall! No USA at All!’ Breitbart News. Retrieved August 12, 2018. ↑ Jasper, William F. (October 26, 2018). “Antifa Witches”: A Glimpse Into the Source of the Demonic Rage Surging About Us. The New American. Retrieved October 26, 2018. ↑ Greenwood, Max (August 31, 2017). Right accuses left of hypocrisy on antifa. The Hill. Retrieved August 31, 2017. ↑ 16.0 16.1 UC Berkeley riots: Violence looms as mayor questioned over ties to extremist group. Fox News. Retrieved April 25, 2017. ↑ Ernst, Douglas (August 29, 2017). Dartmouth professor calls Antifa violence ‘vital’ form of ‘collective self-defense’. The Washington Times. Retrieved August 29, 2017. ↑ Richardson, Valerie (August 29, 2017). Nancy Pelosi condemns antifa for first time as radical leftists wear out welcome. The Washington Times. Retrieved August 30, 2017. ↑ Richardson, Valerie (September 13, 2017). Antifa violence splits left as another major protest looms at Berkeley. The Washington Times. Retrieved September 15, 2017. ↑ Kew, Ben (September 8, 2017). Tim Kaine Refuses to Condemn Antifa: ‘Don’t Like Broad Brushes’. Breitbart News. Retrieved September 8, 2017. ↑ Starr, Penny (August 19, 2017). CNN Normalizes Antifa: Leftists ‘Seek Peace Through Violence’. Breitbart News. Retrieved August 19, 2017. ↑ Chuck Todd under fire for 'softball' interviews with Antifa ally. Fox News. August 21, 2017. Retrieved August 21, 2017. ↑ Tucker Is Right: ‘Antifa’ IS The Militant Wing Of The Democrat Party RedState. August 29, 2017. Retrieved August 29, 2017. ↑ Adler, T.D. (August 31, 2017). Wikipedia Editors Seek to Downplay Antifa Violence And Far-Left Ideology. Breitbart News. Retrieved August 31, 2017. ↑ Richardson, Valerie (October 14, 2018). Portland mayor stands by decision to allow Antifa to block traffic, hassle motorists. The Washington Times. Retrieved October 14, 2018. ↑ Kirkwood, R. Cort (October 15, 2018). Portland Mayor Lets the Goons Rule as Anti-Trump Violence Escalates. The New American. Retrieved October 15, 2018. ↑ Williams, Katie Bo (September 14, 2017). Antifa activists say violence is necessary. The Hill. Retrieved September 14, 2017. ↑ O'Reilly, Andrew (August 30, 2017). Antifa violence leaves leftists to question whether movement hurts or helps. Fox News. Retrieved August 30, 2017. ↑ Protesters at Trump's Phoenix rally used gas canisters, rocks to assault police. Fox News. August 23, 2017. Retrieved August 23, 2017. ↑ Cheong, Ian Miles (June 19, 2017). Antifa Website Encourages ‘All Manner of Physical Violence’ Against Trump Supporters and Capitalists. Heat Street. Retrieved June 20, 2017. Suarez Sang, Lucia I. (September 3, 2017). FBI, DHS warned of increasingly violent Antifa clashes in 2016, documents show. Fox News. Retrieved September 3, 2017. Meyer, Josh (September 1, 2017). FBI, Homeland Security warn of more ‘antifa’ attacks. Politico. Retrieved September 1, 2017. FBI and Homeland Security deem antifa 'domestic terrorists' as they warn of escalating violence between the left and white nationalists. Daily Mail. Retrieved September 1, 2017. Binder, John (August 12, 2018). Watch – Antifa Mob Pepper Sprayed After Attacking Police: ‘Move Back!’ Breitbart News. Retrieved August 13, 2018. Binder, John (August 12, 2018). Watch: Antifa Launches Fireworks at Police, Chants ‘F*ck the Police!’ Breitbart News. Retrieved August 13, 2018. Rodriguez, Katherine (August 12, 2018). WATCH: Antifa Activists Threaten Cops: ‘Without That Badge You a B**** and a Half!’ Breitbart News. Retrieved August 13, 2018. Caplan, Joshua (August 12, 2018). Video: Antifa, Secret Service Agents Clash Near White House. Breitbart News. Retrieved August 13, 2018. ↑ 39.0 39.1 39.2 Kirkwood, R. Cort (August 13, 2018). Antifa Goons Attack Cops in D.C. and Charlottesville; Want to Kill Trump. The New American. Retrieved August 13, 2018. ↑ 40.0 40.1 Williams, Jennifer (August 12, 2018). Antifa clashes with police and journalists in Charlottesville and DC. Vox. Retrieved August 13, 2018. Nash, Charlie (August 13, 2018). Far Left Attacks Vox for Reporting that Antifa Attacked Journalists. Breitbart News. Retrieved August 14, 2018. ↑ 41.0 41.1 Kraychik, Robert (August 12, 2018). WATCH: Antifa Assault Photographer in DC: ‘Get the F*** Out of Here!’ Breitbart News. Retrieved August 13, 2018. ↑ Binder, John (August 12, 2018). Watch – Antifa Shouts Down USA Today Reporter: ‘You Don’t Even Know Who the F*ck We Are!’ Breitbart News. Retrieved August 13, 2018. ↑ Kirkwood, R. Cort (August 13, 2018). Antifa Thug Skates on Felony Assault Charges; Sentenced to Probation. The New American. Retrieved August 13, 2018. ↑ Kirkwood, R. Cort (January 30, 2019). D.C. Antifa Leader Who Advocated Murder Arrested for Attack on Marines. The New American. Retrieved January 30, 2019. ↑ Blackwell, Ken (February 20, 2019). The new Democratic Party, where antifa writes the financial regulations. Washington Examiner. Retrieved February 20, 2019. "Anti-Fascism" did not offer a coherent political ideology. In terms of ideas, it was an empty vessel, a mere political dance....It gave the false impression that principled democrats believing in the rule of law and freedom of speech could rub along fine with the dictators of the proletariat, or that democratic socialists had only minor differences with Communism. What is more, it opened up a wonderful arena for the activities of disciplined activists, whose training in the Leninist techniques of splitting and dividing adversaries would run rings round wooly intellectuals....If you were a French trade unionist, tired of the wrangles of the Left, or a British Empire loyalist baffled by the complexities of modern politics or a Christian peace worker hoping to avoid another war, anti-Fascism was for you! Only in the background was the unspoken dialect that, if Fascism was to be Bad, the Good had to lie with the originator of anti-Fascism -- Joseph Stalin's USSR. ↑ Parke, Caleb (November 3, 2017). Antifa apocalypse? Anarchist group's plan to overthrow Trump 'regime' starts Saturday. Fox News. Retrieved November 4, 2017. ↑ Bokhari, Allum (November 4, 2017). ANTIFAIL: Low Turnouts At Nationwide ‘Refuse Fascism’ Protests. Breitbart News. Retrieved November 4, 2017. ↑ Parke, Caleb (November 7, 2017). Antifa, leftwing anti-Trump protests nationwide turned out to be dud. Fox News. Retrieved November 7, 2017. This page has been accessed 17,139 times.